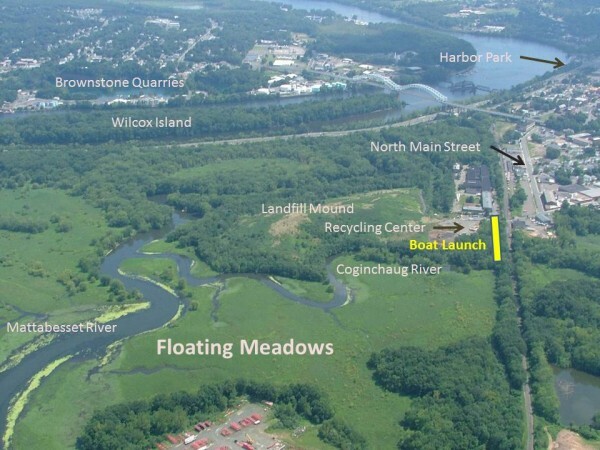 In 2006, the Jonah Center for Earth and Art wrote a federal grant application on behalf of the City of Middletown for $50,000 to construct a car-top boat launch on the North End Peninsula, site of the current Middletown Recycling and Transfer Station. (Until 1991, the North End Peninsula was operated as an open household garbage and commercial waste landfill. Long ago it was a source of clay for local brick-making.) In November 2007, the City of Middletown was awarded the grant of $50,000 for the launch and a hiking trail to the top of the landfill mound. After City officials refused to proceed with the original plan for a variety of reasons, the project was put on hold while an alternative location was sought. A group of Jonah Center volunteers known as the Coginchaug River Access Group (CRAG) scoured every foot of the Coginchaug River bank looking for a feasible site. In 2010, the City agreed to allow the boat launch to be built at another location on the North End Peninsula, provided that the environmental permits could be secured. The project was in the “permitting phase” for over 3 years while various offices of the Connecticut Department of Energy and Environmental Protection (DEEP) and the Army Corps of Engineers reviewed the plans and asked for modifications. By the time the permitting was complete and a plan was approved in early 2014, the cost of constructing the launch in a manner that would meet DEEP specifications had risen to almost $90,000. On September 22, 2014, construction began on the waterfront area (the most critical part of the project) while leaving some upland amenities to be finished at a later date. The work was finished by mid-October! To reach the launch site, go to the intersection of North Main Street and Johnson Street in Middletown. Cross the railroad tracks as if you were going into the transfer station, but instead of going through the gate, turn left and follow a gravel roadway to reach the top of the slope that leads to the river. Leave your vehicle at the top of the slope and carry your boat to the edge of the water. You will be at the edge of the “Floating Meadows” — a 1000 acre fresh water, tidal wetland area that is filled with birds, reptiles, amphibians, fish, and mammals of many kinds. In terms of biodiversity, this area is a virtual “Noah’s Art” — in the sense that it serves as habitat for so many species, and also because it is one of the last refuges for many endangered life forms. 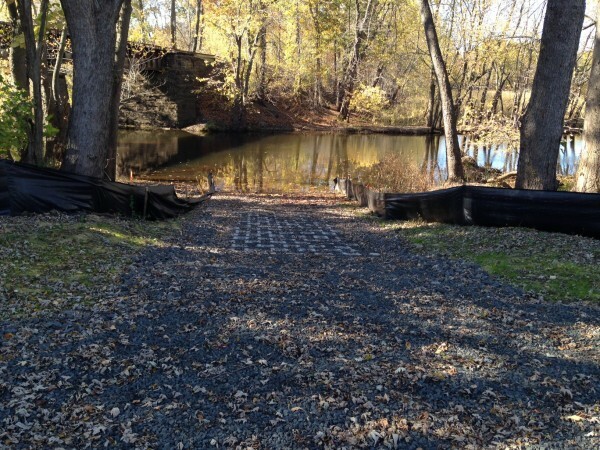 The Floating Meadows also acts as a giant filter system, as microbes on the roots of the aquatic plants clean the polluted water that comes down the Coginchaug and Mattabesset Rivers before they empty into the Connecticut River.